Several years ago Pastor Hugan began holding this Sunday afternoon Bible study class before the evening service. Over the past couple of years, Pastor has dealt with a number of topics classified as "practical theology." "Living the Crucified Life" / "Biblical Separation" / "Liberty, License, & Legalism" / "Precepts, Principles, & Preferences" / "Victory in the Christian Life" / "The Bride of Christ" / "Apostasy" / "The Nation of Israel" / "Biblical Unity" / "The Unseen World" / "Bible Numerics" / "Sin, Suffering, & Sickness" / "Excuses" / "Introduction to Youth Evangelism & Discipleship" / a study on The Minor Prophets / Harmartiology (the doctrine of sin) / Church Discipline. These particular "practical theology" studies use fill-in-the-blank style lesson material. They allow class members to look up the Scripture references and search the Scriptures to find the answers. They are life-challenging and enjoyable to work on. From time to time Pastor Hugan holds Spiritual Leadership Training as part of the ongoing training in the ministries of FRMBC. 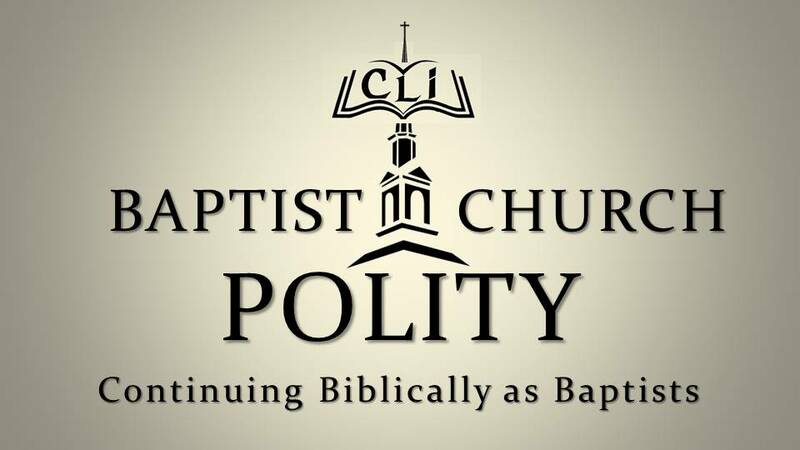 Currently, we are studying the topic of Baptist Church Polity and how to continue as a Baptist church. Topics include Baptist Distinctives, Baptist Church Membership, Baptist Discipline, Baptist Officers, Baptist Government, the two Baptist Ordinances, Baptist Life, and the Mission of Baptists.